I feel like having kids has destroyed my skin! Suddenly, I have the same issues with my skin that a teenager does! So, I'm always looking for products to help me get ride of the old skin cells and dirt in the pores! Does anyone else have this issue since having kids? Mommy Moments with Abby's Review of Stript Wax Vajacial Soap: So, this product was meant for those who wax! I used to wax and spend a ton of money to look good, now if it can't be done in the shower it isn't happening. So, why is it that I found this to be awesome for those of us attached to a razor? I used it on my face as well and loved the buff it gave my face! While this isn't what they intended it for, I really liked that it could help loosen the dead skin on my feet, legs, face, back, underarms, and such. It smelled great with the touches of Apricot coming through. I can only imagine how it would work for those of you who wax, given that it has been helping me smooth and buff my legs after shaving! Plus, it works great for getting a nice deep scrub to your face! Women across the country have been talking about the Vajacial™ spa treatment since it first offered by Stript Wax Bar, California's modern bodoir salon for all things hair removal, and covered by magazines such as Cosmopolitan UK and featured broadcast television on The Doctors. 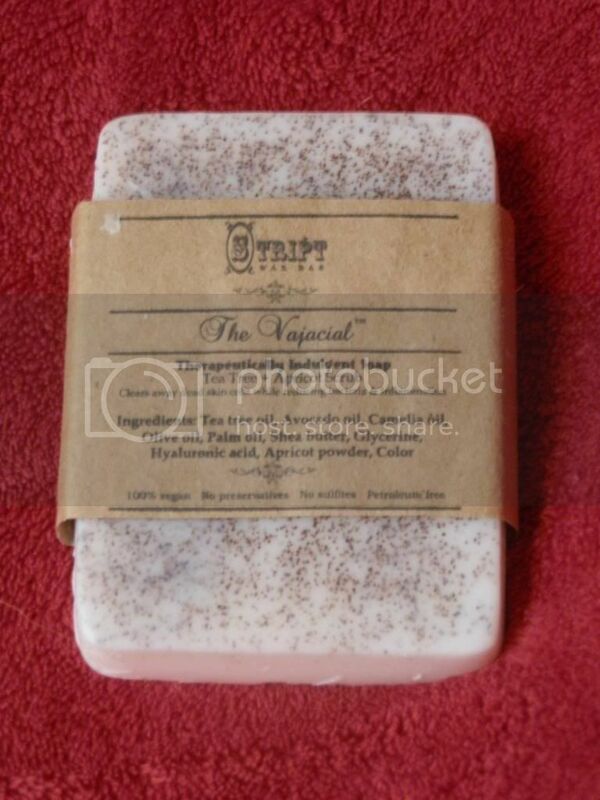 Now, you can get the Vajacial treatment experience at home with Stript Wax Bar's new Vajacial Soap. The Vajacial is the signature in-salon treatment created by Stript Wax Bar's founder/owner Katherine Goldman, national expert in hair removal and skin care, and is a 'facial' designed specifically to pamper and primp your nether regions 1-2 weeks after waxing. The Vajacial and ideal for Brazilian waxing enthusiasts in need of liberation from pesky ingrown hairs or anyone in need of a little freshening up. Stript Wax Bar first opened in 2009 as San Francisco’s first waxing-only salon and now has six California locations in San Francisco, Los Angeles, Oakland, Lafayette and two in Palo Alto, with new salon locations coming in 2013. Designed as a “modern boudoir” with “READY. SET. SMOOTH.” as the motto, the salons feature front-of-house brow waxing and makeup services and back-of-house private settings for intimate waxing and other treatment services. The Los Angeles location features the exclusive Vanitymark Brow Bar developed by celebrity makeup artist Brett Freedman. Stript Wax Bar offers a complete selection of hair removal services and post-wax treatments, such as mineral makeup application, spray tanning, facials, brow shaping, Depilar System enzyme-based permanent hair reduction, the signature Vajacial™ the and most recently the Brojacial™ for men and a custom curated selection of retail items including the most effective, exclusive and hard to find skin and body care products as well lingerie and accessories. For more information and salon locations, visit www.striptwaxbar.com.